There are days when nothing goes right. In 1889 the Louisville Colonels of the American Association had a month like that. The hapless Colonels, on their way to a dismal 27–111 season record, set the major-league team record for consecutive losses at 26. The final loss of the streak came in the second game of a doubleheader against the St. Louis Browns on June 22. The Colonels were just back from a fourweek Eastern road trip, having lost 21 games in Cincinnati, Columbus, Philadelphia, Brooklyn (one of them played in Newtown, the Brooklyn club’s Sunday home), and Baltimore. The losses were hardly the only unusual aspect of the trip. After a pair of home losses to Baltimore, Louisville had been swept in four-game series at Cincinnati and Columbus. The Colonels were scheduled to play in Philadelphia on June 4, but the squad did not show up. The players turned up two days later in Philadelphia, reporting that their train had been stuck for two days in northern Pennsylvania because of flooding along the Conemaugh River that had washed over the track. It turned out to be backwater from the deadly Johnstown Flood. The delay did nothing to improve Louisville’s performance. The Colonels dropped four to Philadelphia and then went to Brooklyn and did the same. The road trip moved on to Baltimore, where things really got interesting. The Colonels were owned by Louisville businessman Mordecai Davidson, a man who brooked no opposition to his management actions. A hard contract negotiator, Davidson was deeply unpopular with the players. After losing the opening game at Baltimore and experiencing several more Davidson fines, members of the club went on strike. All but one unknown player signed a letter to Davidson stating that they wouldn’t play unless the fines were dropped. Davidson, not surprisingly, refused. The player uprising was not Davidson’s only concern. A week earlier he had attempted to sell off most of his players to recoup his investment in the team, only to be blocked by the league since it meant the dissolution of the franchise. While the player strike was in progress, Davidson was also defending himself at an American Association meeting in New York. Davidson met with the players in Baltimore, but it was hardly a conciliatory session. He increased the fines for errors on the field to $50. The result was that six players—Guy Hecker, Pete Browning, Dan Shannon, Harry Raymond, Red Ehret, and Paul Cook—refused to take the field for the game on June 15. Filling out their lineup with local amateurs, Louisville lost a 20th straight game, 4–2. Baltimore manager Bill Barnie intervened and persuaded the six strikers to return to the field, telling them that the league would determine the outcome of the fines. After three more losses, the ragtag Colonels headed back to the Bluegrass with a season’s record of 8–43. When the club arrived in Louisville on June 21, it was payday. Since the Association had not considered the players’ complaint and since Davidson was holding firm on the fines, the players received meager pay envelopes. Guy Hecker, a winner of 52 games in 1884, was reported to have received a total of $1.95. Browning, the team’s batting star since 1882, was in the hole by $325. These events did not inspire the players to new heights of vigor, and they dropped the first game of the home series with St. Louis, 7–3. 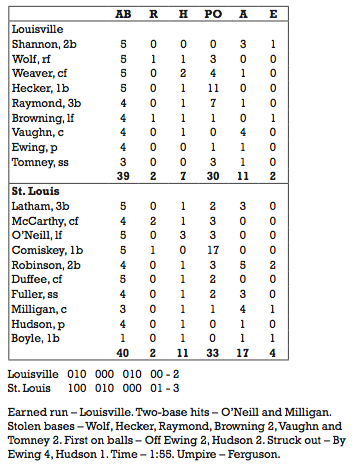 The first game of a June 22 doubleheader saw Louisville jump out to a 3–0 lead after three innings. But they trailed 6–3 after four and ultimately lost 7–6, with St. Louis pushing over the winning run in the ninth. 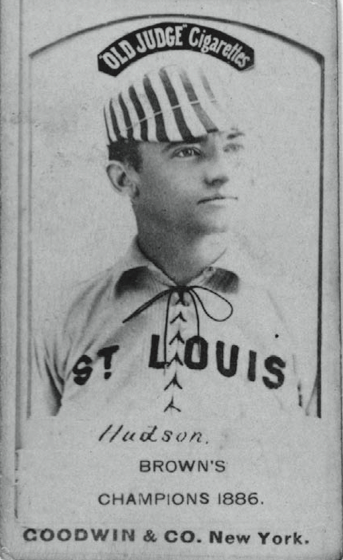 Game two matched Louisville’s John Ewing against Nat Hudson for St. Louis. Louisville elected to bat first and the Colonels were retired in order. Ewing, brother of future Hall of Famer Buck Ewing, retired lead-off hitter Arlie Latham before surrendering a scratch single to Tommy McCarthy. A passed ball and a double by Tip O’Neill put the Browns up 1–0. With two outs in the Colonels’ second, Browning and Farmer Vaughn delivered infield singles. Browning stole third and scored the tying run. Louisville threatened again in the fourth when a two-out error by second baseman Yank Robinson put Harry Raymond on first. Raymond stole second and took third on catcher Jocko Milligan’s wild throw. Browning then sent a scorcher down the third-base line. Latham corralled it and threw out Browning at first to end the inning. Latham opened the St. Louis sixth with a single, but was thrown out by Vaughn attempting to steal second. McCarthy was issued a four-ball walk. (1889 was the first season in which the walk rule was reduced to four balls.) O’Neill singled, sending McCarthy to third, and he scored on Charlie Comiskey’s sacrifice fly to center. Louisville was retired routinely in the sixth and seventh. In the eighth, the Colonels’ Chicken Wolf singled with two outs and took second on an error at first base. Farmer Weaver singled him home with a hit to center. The score remained 2–2 into the 11th. After Louisville was blanked in the top half, Comiskey led off the bottom of the inning with a line drive to left field. Browning made a long run and briefly had the ball in his grasp, but it fell to the ground for an error. Jack Boyle, who had replaced the injured Robinson in the ninth, singled, putting men at first and second with no outs. Charlie Duffee hit a long single to center, scoring Comiskey and giving St. Louis a 3–2 win, and the Colonels a 26th consecutive loss, a major-league record that still stood in 2012. The losing streak came to an end the next afternoon. Louisville built a 5–0 lead off Icebox Chamberlain after three innings, two of the runs courtesy of Comiskey, Yank Robinson’s fill-in at second, who made four errors in the third inning alone. Tom Ramsey got the 7–3 win, Louisville’s first since May 21. In early July Davidson surrendered the franchise to the American Association. A new group of Louisville businessmen bought the team and paid the players the fines Davidson had refused to return.